First up, Disney has announced a promotion for Alice in Wonderland using Facebook. They have set up three fan pages. One each for the White Queen (Anne Hathaway), Red Queen (Helena Bonham Carter), and Mad Hatter (Johnny Depp). The group that has the most followers on Thursday July 23 at 4 PM Pacific Time will get to see the debut Alice trailer that's been in the news lately. Slashfilm has posted a description of the trailer. If you want to keep it as a surprise stop reading now and continue to the photos, below. 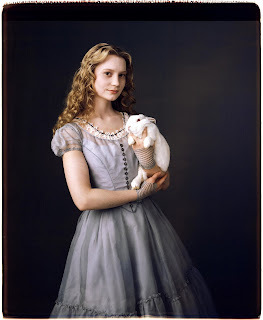 Alice in Wonderland features gorgeous imagery. Alice never speaks in the trailer. Depp does a voiceover for the trailer as the Mad Hatter. 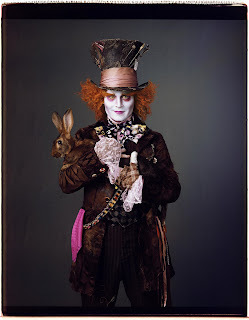 “There is a place like no place on Earth… some say to survive it you need to be mad as a hatter. 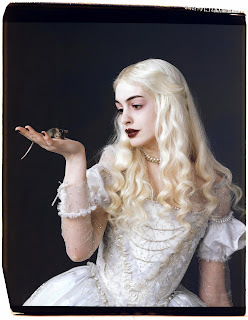 Which, luckily; I am.” We get to see Alice discover and fall into the rabbit hole. Drinking the potion and shrinking. They show the Cheshire’s face as they did in the animated Disney film - as a floating head. Never complete. I also caught the White Queen, Red Queen, Rabbit, the Tweedles, and some characters that I assume are new for this version. The 3D in Alice is subtle. It didn’t appear to have anything thrown in just to prove it was filmed in 3D. Here are the new photos! 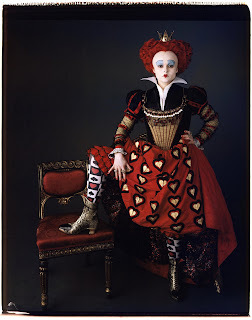 You will notice that the Red Queen photo has changed.